Senior Fatah official Tawfiq Tirawi slams Hamas executions, brutalization of Fatah members in Gaza, compares with ISIS. A leading Fatah party member has compared Hamas's methods of executing and brutalizing its political opponents in Gaza to the gruesome executions carried out by the "Islamic State" terrorist group, or ISIS. In an interview with the Palestinian Authority's official TV station, Fatah Central Committee member Tawfiq Tirawi expressed his anger over a string of executions and shootings of Fatah members in Gaza during Operation Protective Edge, and said the "unity deal" between Hamas and the Fatah-run Palestinian Authority was "a mistake." Prior to his interview, which was translated by MEMRI (Middle East Media Research Institute), Al-Awda TV aired footage from an interview with a Fatah member from Gaza who said he was maimed by Hamas gunmen for leaving his home after being put under house arrest. "I was told that I was under house arrest - I was forbidden to leave home - for reasons unknown to me," the man, who was lying on a hospital bed with his wounded legs under a sheet. His identity was hidden for obvious security reasons. He said that despite that fact he went outside "but stayed close to home. I didn't go far away." "All of a sudden, a car with three men stopped. They got out and told us to stay where we were," he recalled. "They asked me my name, and I told them, and then all three of them opened fire at me." His story matches dozens of other accounts by Fatah members who say Hamas used the fog of war to settle political scores with its rivals. Palestinian Authority leader Mahmoud Abbas has spoken out against the attacks on several occasions, most recently in an interview last week. But Tirawi was distinctly less diplomatic. "I do not believe that we can keep quiet about what was done to our people in Gaza," he said, blasting Hamas for what he later described as the "nightmarish" way it was treating members of its supposed "unity government" partner, Fatah. "National unity is not just an agreement that you sign," he fired. "That agreement was a mistake, a mistake, a mistake. It was dictated from above. A bulls*** agreement with no details and no mechanism for implementation," such as who would actually run Gaza and its numerous "security agencies". Tirawi also accused Hamas of undermining efforts to fight against Israel. "If we want to wage war we must be united and prepared. How can we possibly be prepared, when Fatah members in (Gaza) are forbidden to bear arms and fight?" He claimed that several of the more than two dozen men summarily executed by Hamas during Operation Protective Edge were "officers in the security agencies." 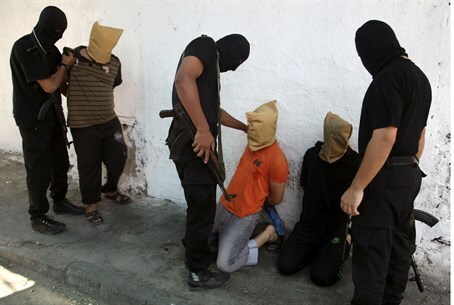 "Hamas says they are spies. Did they place them on trial? Did they interrogate them? Where are the confessions?" he demanded. "According to what laws did they execute these people? What is the difference between (Hamas) and Al-Zarqawi, not to mention ISIS?" he continued. Abu Mousab Al-Zarqawi was the infamous and brutal founder and head of ISIS's predecessor, the Islamic State of Iraq. "I don't want to mention ISIS, which beheads people," he went on, but then asked: "What is the difference between beheading people and executing them by gunfire? Aren't they both killers, regardless of the execution method, which we all denounce?" Hamas proudly and openly broadcast news of the executions, including photos of menacing-looking masked gunmen lining up the victims for execution, in an attempt to project strength in the aftermath of a series of Israeli airstrikes targeting key Hamas leaders. But the images - as well as the very use of summary, public executions without trial - caused many people to compare Hamas to the Islamic State, which broadcast footage of the brutal beheading of US journalist James Foley at around the same time. The comments surface after tensions between Hamas and the PA have begun to boil over, with Hamas ordering its members in Judea and Samaria to resist summonses for investigation by PA forces earlier this month; recently Hamas staged a failed coup attempt on Abbas in Judea and Samaria.